We are sorry for last week’s interruption; we found the culprit and made sure that he is under custody for his disruptive behavior, at least for the time being. 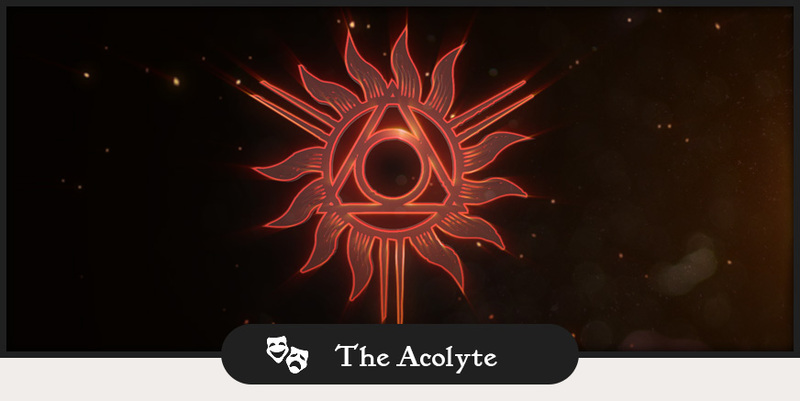 We will ensure that we keep a close eye on him in the future, but we have a bad feeling that we have not seen the last of our dear friend, the Acolyte. With only two months until the end of the year and four months up to launch, what is going on in the world of Anno 1800 and the Union? We are also busy laying the groundwork for our previously announced large-scale technical test with many more Union members (sign up!) and reviewing your contributions to the Expeditions contest. The next episode of our AnnoCast is on the horizon! The AnnoCast will make its (hopefully much anticipated) return next week Thursday, November 8. We heard many of you say that you want to see some proper gameplay and therefore decided to settle on a new island to show you the Farmer and Worker lifestyle. Let us see how far we ca get during our stream! As always, we are happy to answer questions both from the chat as well as from the Union, so leave us anything you want to see answered in the comments! 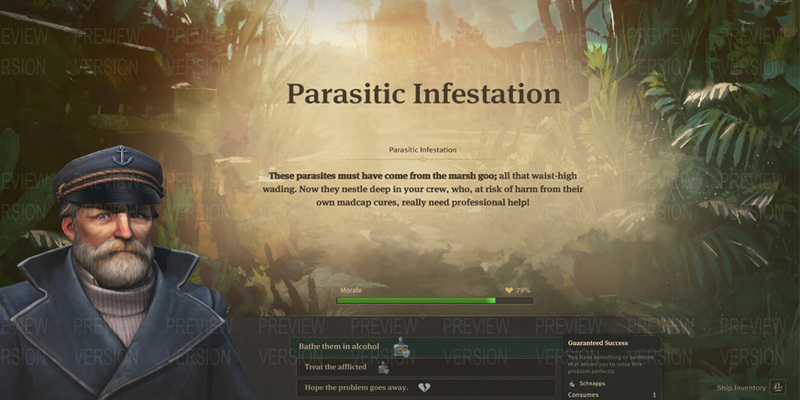 Will you be able to enable/disable the pirates or set a game difficulty for a pirate difficulty? Or will it be just another enemy? Which city incidents will happen on the three different difficulty levels? Answer: Second-Party characters all have their own difficulty rating, which in many ways reflects their personality and behavior. As third parties don’t directly compete with the player in military or economic warfare, they won’t affect the difficulty of your session. However, pirates are an exception, as they work actively against the player and even other AI. You will be able to choose the pirate characters for your session or even exclude the pirate characters from your match. For now, the two pirates have a set difficulty although both characters have different personalities and therefore, react differently on your actions. When it comes to city incidents, fire, strikes and illness will haunt your metropolis while their frequency is based on the difficulty setting of your match. We will show you that system in detail in a future DevBlog, as especially strikes are an exciting new feature in Anno 1800. I like that you have so many options to create your custom session. I am also happy to see that the random generator in combination with the seed codes makes a comeback. 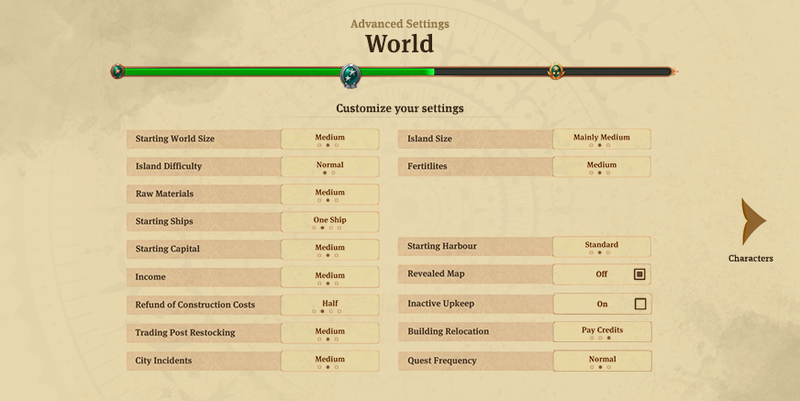 But there is one question for me: in vein of older titles such as 1701, will the game have a world editor which allows us to place our own islands, fertilities, resources or starting position? Answer: We focus on the core features on the game, as we want to deliver true quality for old and new fans of the series. Therefore, there are currently no plans to develop a World Editor for Anno 1800. replayability is one of our top priorities, the game will release with over 50 handcrafted islands, and many of them come additionally with their own island variations. Where are the female characters in the old world – or will I be forced to only deal with men as long as I manage to escape to the New World in order to meet the female cast? 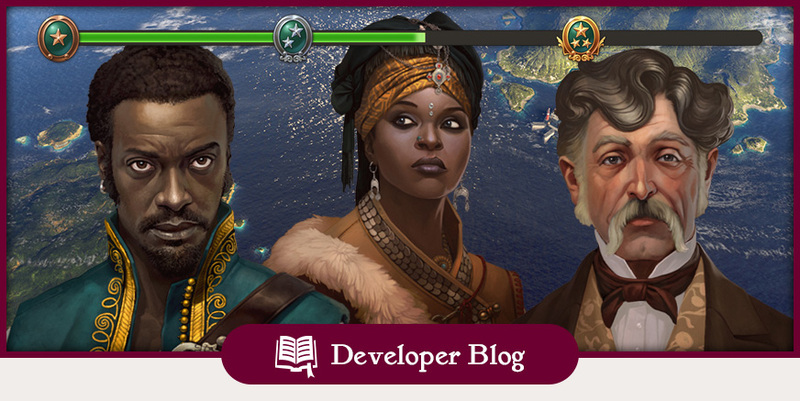 Answer: The world of Anno 1800 will be populated by a diverse cast of characters, among them Women and Men with their own special personality, which will mirror in their behavior when building cities or their reactions in our diplomacy system. You will also be able to choose your own player portrait, where you can decide, among other things, to choose a female or male portrait. Will we be able to set the map small/medium if we want to play multiplayer with multiple people? Anno 1404 does not allow us to choose map size accept huge when we try to play with 4 players. Answer: Yes, you will be able to play on small maps with 4 players or non-player characters. But beware, on a small and densely populated map, there will be a lot of competition about the control of the more precious resources if players want to reach the fifth residential tier. I like it when I have 2-4 options (easy, med?, hard, insane?) with useful defaults for the main mission? Normal Mode: Will provide you a large world and island space, rich mineral deposits, challenging but not too hard opponents and free relocation and full construction refunds. Advanced: Less money, harder opponents and an average world and island size. Many smaller options such as relocation of buildings won’t be free anymore. Expert: This one will get you on your toes, only a few coins in your pocket while fighting for every single yard against the most cruel and efficient enemies on small and everything else than fertile islands. Who have we here? You are in dangerous waters. You know not with whom you meddle. Leave if you value your life. Else all shall burn. We are the fire bringers. The sixth age of man approaches. All must bow to the flames. You will be our fuel. Anno 1800 will offer builders a wide range of features, from time-honored proven favorites to all new additions to the series. One thing that is unchanged, however, is the ability to sink hundreds of hours into the game, and a big part of that is the ability for the players to set up their very own customized sessions, which has always been a cornerstone of the experience. We know that Anno fans love to be able to tailor the game’s challenges to their own (or their friend’s, of course) specifications and needs. So today, we want to give those veterans and newcomers like the first look at some of the customization options you will get to enjoy in Anno 1800. Create your own island paradise, or meet a brutal challenge! Similar to some previous Anno games, a dynamic difficulty bar that will give you a better feeling for how big of an impact your rule adjustments will have on the overall challenge. Start World Size – A small archipelago for a quick match or a huge sandbox to play around in? This setting determines the actual size of your session. Island Difficulty – A pancake will not provide a proper challenge for a true Anno veteran! Harder islands will challenge your city planning with a higher density of mountains, smaller beaches, and rivers. Island Size – Some players might prefer many small islands for outposts or large-scale landmasses to give their cities enough space to grow. Raw Materials – You said there isn’t enough copper on your island? A high amount of raw materials will not force you to expand as quickly and will, therefore, make the game easier. Fertilities – Dictates how much of a factor the various fertilities your island can (not) have. Starting ships – Is your flagship enough or would you prefer a small fleet of trading vessels? Or how about a fleet of warships? After all, there is nothing wrong with a good naval rush among friends! Starting Capital – Money makes the world go round. The more money you have at the start of a game, the easier it is to establish your economy before getting into financial trouble. Starting Harbor -> Do you want to start with an already settled island (maybe even fully stocked with some starting construction materials), or do you prefer to establish your first Imperial Harbor on an island of your choice? Revealed Map – Being able to follow the moves of your enemies or friends in multiplayer can speed up things quite a bit. Income – Defines the ratio of how much money your residents generate. Refund of Construction Costs – If you destroy buildings to make space for your new leisure park area, do you want to get some previously used materials? Building relocation – Decide whether you want to be allowed to freely move buildings around, or if there should be an attached cost. Trading Post Restocking – Influences how quickly third-party characters will restock their trade goods on offer. City Incidents – Some people want to see the world burn while others prefer a peaceful building experience without disturbing fires or riots. Inactive Upkeep – Turning off building upkeep costs will make the game significantly easier. Quest Frequency – If quests tickle your fancy, you can boost the rate of quests generated by AI opponents or neutral factions for you to undertake. Of course, it wouldn’t be a proper Anno game without a distinctive cast of characters and the freedom to decide if you would rather compete with the visionary (albeit slightly megalomaniac) architect Gasparov or would prefer for some easier going fellas to join your beauty building extravaganza match. 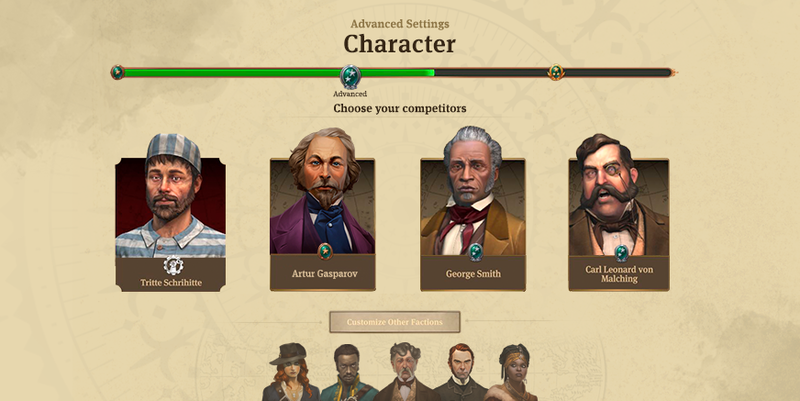 As always, you will be able to choose up to three second-party AI characters as well as neutral factions such as traders or even those pesky pirates. Keep in mind that each character comes with their own personality, which also gives them their own difficulty rating. And if you really like the world you find yourself in and want to share it with your friends, make sure that you note down the unique match seed code to recreate your experience at any time. You will of course also be able to have the game generate a random seed for you to get the proper feeling of venturing out into the unknown. With custom game rules being a time-honored tradition of the Anno series, we’d love to hear from you. Do you have a set of standard rules you always go for or do you change the setup based on your current mood? And do you have any great war stories or tips for newcomers to share with the class? Take to the comments to let us know! 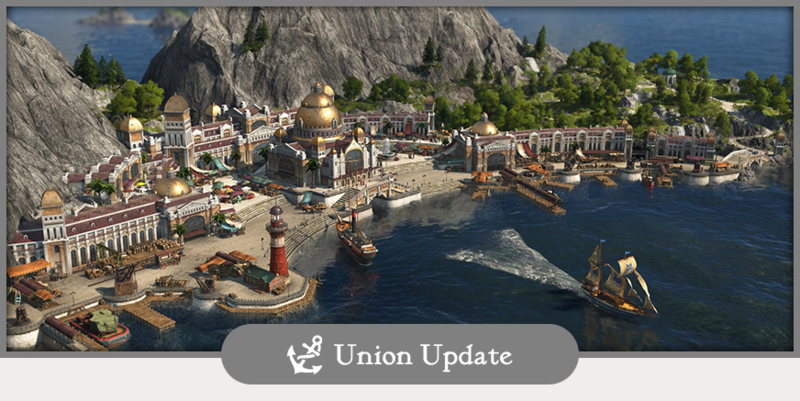 In today’s Union Update blog, we want to give you a brief Anno 1800 production update and provide some additional answers to questions inspired by some of our recent blogs. Later this week, you can look forward to a DevBlog on some of the game’s customization options for sandbox games. Let’s get to it, shall we? As our February 26 release date looms large and inches ever so closer, we have been busy little bees and made some great progress. We recently finished another milestone, so let us check in with our Production Team to get an update on was has been happening these past few weeks. Keep in mind that these are just two notable highlights, but by no means a comprehensive list of everything we have worked on, as all the disciplines and teams (like Art, Game Design, Game Programming etc.) have their own separate goals for each milestone. We know that many of you are very curious – or should I say burning – to learn more about our naval combat. Which is why we want to make sure that when we show it to you, it will all be live and in action inside the game, rather than with a lot of text and mock-up images. Which is why you will be happy to hear that we have made great progress with the polishing of the naval battles during the last milestone, laying the foundation we need for an in-depth look in the future. We are also right in the middle of our localization and audio efforts for the game. During the month of September, we recorded all the English voice acting for the various AI characters and the cast of our story-based campaign. At the same time, with all the game text now largely finalized, we are also busy working with the respective teams to translate it into all the other languages we will support (some of which will have localized voice recordings as well). We are happy to say that we will be supporting localized text in more languages than ever before in an Anno game, giving all new audiences the opportunity to immerse themselves in the 19th century in the language of their choice. We are also analyzing the feedback from the recently concluded playtest to see which items need to be addressed. Given this late stage of development, we have to always consider what changes are feasible, and how they may affect development of other features to make sure that we make the best use of our remaining time. With that said, the feedback from our play testers is still highly valuable for us, especially as we will focus more and more on nailing the game’s balancing. This is also where the data from our upcoming larger-scale test will come in handy to give us insights from a big group of players. 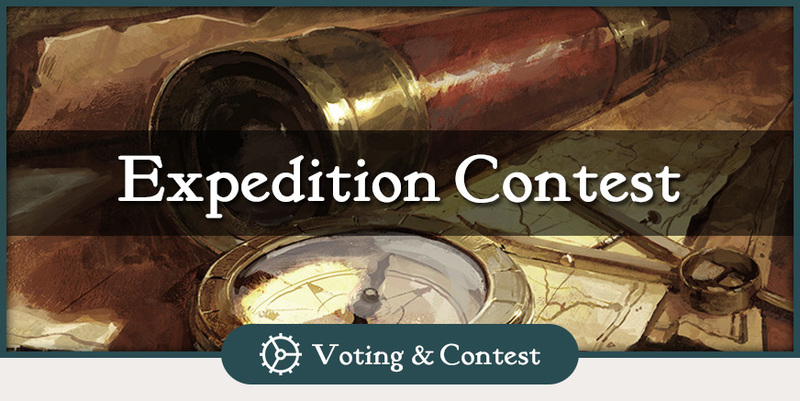 A reminder for all you writers and expedition event designer out there: the expedition contest submission deadline ends next week on October 22.10 so make sure that you hand in your event ideas until next Monday. And if you have any questions regarding the contest, we will try to answer them in the comment section of today’s update. You can find the contest details here. I like that products from the old world will be required in the new world, so my ships won’t have to make the return trip with empty loading bays. Talking of which, the production chains shown in the blog include wood. Could this also be imported from the old world? Answer: Yes, you will be able to just import goods from your Old World to use them in your production chains in the second session and vice versa. Will it be possible to save blueprints for future use, for example to save entire production chains as templates, which could then be quickly placed in the future? Answer: It won’t be possible to save whole layouts as this would require a lot of work on UI and UX, as we would need to develop a whole interface for that feature including menus, possibilities to save and to sort your layouts. However, we like that feature and closely watch how players will make use of the blueprint mode and how much feedback we get regarding that feature after launch. You mentioned a botanical garden in the blog. I already suggested this when you first revealed the zoo, so I was wondering if there is still a chance to see such a garden in the game? 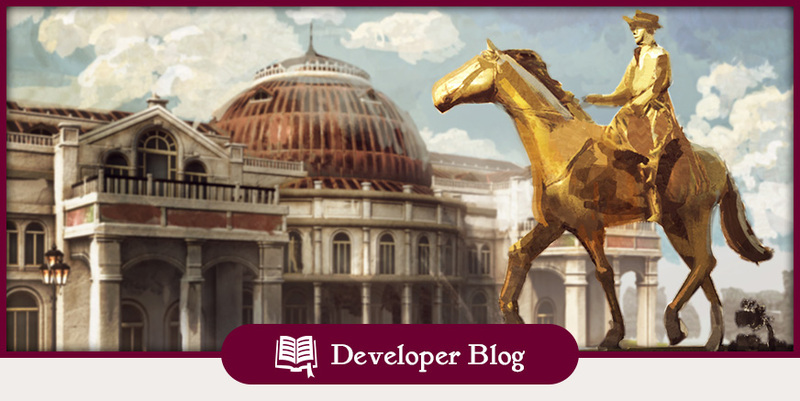 Answer: At release, Anno 1800 will come with the Zoo and the Museum as large building projects supporting the new city attractiveness feature. Both projects come with a huge amount of assets, from modules, animations and dozens of items each. As always, we will watch feedback closely and see what the post-release future may hold for Anno 1800. So the small stuff in your exhibition you can only see as icons, isn’t there some form of a magnifying glass to show you what is inside? Like when you click the building , the roof get’s stripped off and you could see what’s inside but magnified a bit? Answer: Small items will all have their own artwork for their actual icon but with the huge amount of museum items alone in mind, this would mean that we would have to model 80 3D assets just for the museum alone and also find ways to display small pieces like a necklace inside a building. We just implemented a nice overview window accessible from the zoo or museum entrance that will allow you to check how many items from which set you own. The museum wing buildings in combination with the amount of huge open-air exhibition pieces will nonetheless offer a lot of visual variety to express your inner museum curator to your heart’s content. Will I always get the same results when I do an expedition again and pick the same option, or is there a random numbers generator at work behind the scenes that will allow for different results? And will there be rewards for nice and beneficial decisions, or only if you act mercilessly and reckless? Answer: Every decision you make has a chance of success based on a general difficulty and the skill ratings of the items and characters you brought along. In addition, some items will offer unique additional decision options on specific events and some combinations even guarantee a success. If an event fails, there are various outcomes for the story to progress. As you might have seen during the various instances of our Love Island presentations (RIP Captain, Comedian and Bishop). The type of decisions you make won’t have an influence on the final reward pool of items during an expedition, even though special decisions and events can reward you with items from the event pool. 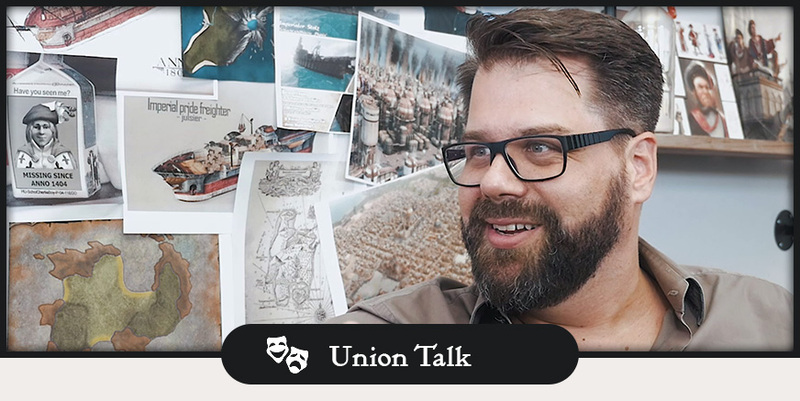 We are knee-deep in the de… the final development phase of Anno 1800, and while the big event season with the likes of gamescom and EGX lies behind us, there is still plenty happening in the Anno Union world. 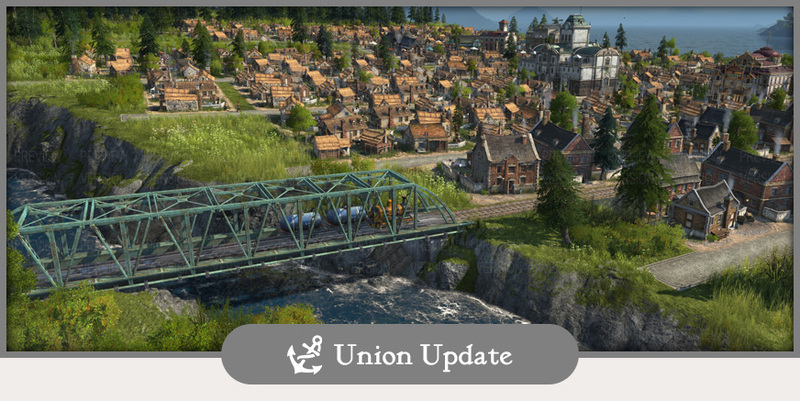 Another Union focus test round just concluded and we are working to finalize our content roadmap for those all-important last few months prior to the release of the game. Due to that workload, it can happen that some content might suffer a slight delay, as some of you might have already noticed, but we are working hard to ensure you are well entertained leading up to the big launch date. To give you a glimpse at our upcoming content: We plan to host Livestreams more frequently, will provide fan material such as wallpapers, highlight your community projects and will tackle important outstanding topics such as naval combat or multiplayer in detail. And not to forget, we will also open the floodgates of our focus playtesting to allow more Union members than ever before to test the game. While we are on the playtest subject: we need to talk! The players of the latest focus test provided us once again with a large amount of incredibly helpful feedback and we are still going through the extensive test reports. 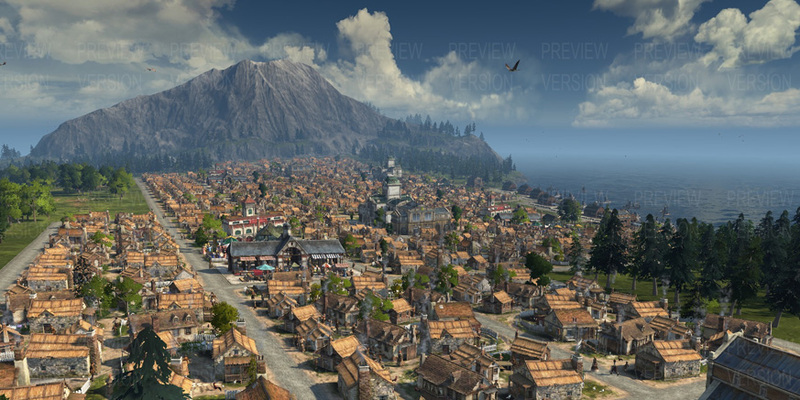 But we are confident to say that the latest results show that Anno 1800 is on the right track to deliver a game Anno fans can get excited about, even though there is still a lot of work to do prior to the release in February. In order to make sure that we get as much feedback and data as possible, we want to invite a significantly higher amount of Union members for the next phase of the focus test. This huge test will happen as early as this year and will be exclusive to members of the Anno Union. So if you are just a reader on our page, make sure that you register on the Anno Union page with your Uplay account as soon as possible to secure your chance at being invited. And to give you some visual impressions from the latest test, here are a few screenshots from our testers (we won’t publish the names as the test is still covered by an NDA). Okay this guy won’t have any issues with Tier 1 workforce anytime soon! Hey that’s what I call a teaser! 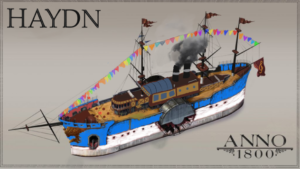 Keyword feedback: We have not missed your comments regarding the Ship Design Contest in last weeks Union Update. Because of that feedback, we will make sure that for future votes, we give you a chance to vote on a final selection on entries to determine the winner. When talking about the skill regarding the execution of these submissions, the idea behind an entry is as important for us as the actual craftsmanship of the community member, be it a drawing, writing or any other submission (even though we are often amazed by the true display of skills in some of your work). When we are talking about content that is supposed to be added to the game, keep in mind that we also have to check if an idea is feasible within our production pipeline. Notwithstanding the above, we want to honor exceptional creative takes and creations with a proper showcase on our Anno Union channels. And with that, we are already at the end of today’s Union Update. Don’t forget to share your thoughts, suggestions and feedback in the comments below. 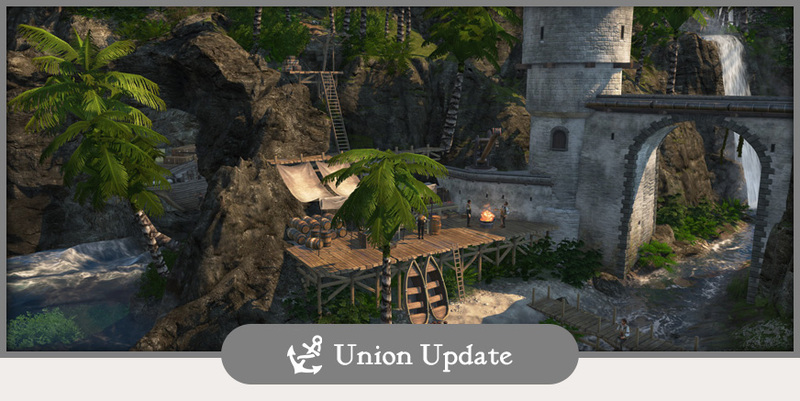 Moreover, we are always eager to get your ideas for the Anno Union and the Union Updates. Today, we will wrap up our deep dive debrief of the new features unveiled at gamescom 2018 with a trip to the museum, and a look at the new blueprint mode. Franklin, Livingstone, von Humboldt… the 19th century was an age of intrepid explorers setting out to discover unknown frontiers and to uncover the mysteries of the world’s most remote locations. For the vast majority of people however, such travel was impossible, leaving them to satisfy their curiosity with travel reports or newspaper articles. Soon however, all this talk of travel and far-away lands lead to a hunger for “the real thing”, with people flocking to zoos, museums and botanical gardens to catch a first-hand glimpse of all the wonders they had read about. In keeping in this spirit of curiosity, you will be able to build your very own extensive museum in Anno 1800, offering you a second major tourist attraction to build alongside your zoo. At first glance, the museum works quite similarly to the zoo. 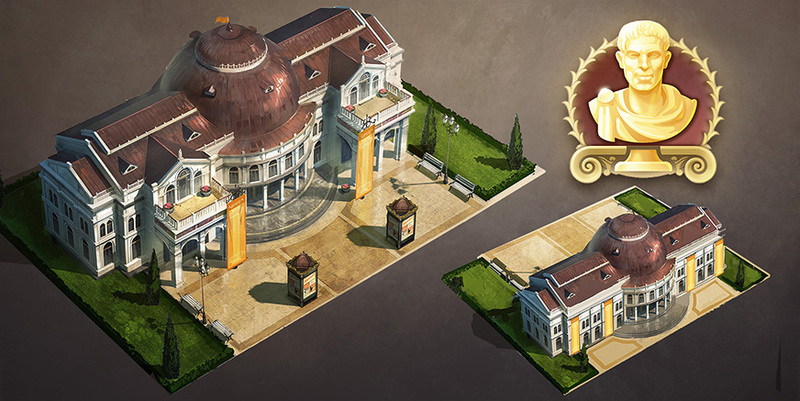 Unlocked at residential tier 3 (the Artisans), you start your project by constructing the main entrance/ building of the museum, after which you can start placing modules to slot your various exhibits into. Modules only need to be connected by a single tile, which gives you a lot of freedom when it comes to finding your perfect layout for the museum. During this time, it was not uncommon to display priceless antique statues in playful pleasure gardens. We try to embrace this mindset, so all the larger artifacts you can acquire will be displayed as actual 3d models in the open air, allowing you the best possible view of your collected treasures. While the eye-catching elements of the zoo make heavy use of animated animals, the museum will have a large set of structures, such as temple ruins, antique mosaics or even dinosaur skeletons. Lower tier items such as amulets, old swords or other smaller artifacts will be displayed in special houses, which vary thematically, while still having their own unique 2d artwork. At launch, we hope to have around 80 possible artifacts to display in your museum, which will be organized into thematic sets like “dinosaur skeletons” or “proto-historical”. 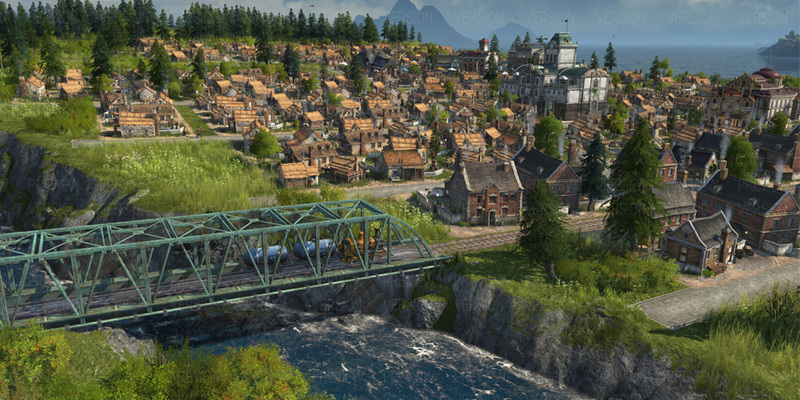 Anno 1800 archaeologists and history enthusiasts can look forward to nine different sets in total, a perfect opportunity for us to hide some Easter Eggs and Anno throwbacks. There is a lot to collect on our archaeological expeditions but we do not want spoil all the different themes and sets quite yet. Working on a layout for a new industrial district or a nice artisan quarter is one thing, but if you start large scale projects such as the zoo or want to create a stunning avenue around your world fair, things can get complicated. The new blueprint mode is the perfect tool for aspiring architects, as it allows you to plan street layouts, districts or even whole cities in advance before laying down the first stones. The blueprint mode is a rather simple but nevertheless extremely powerful tool. Once activated via your toolbar, all buildings placed will only show as ghostly silhouettes, indicating the spot for your future residence or factory. You can now take your time to work on a small layout for a few new production buildings or continue to work on your large park around the city center you always dreamed of. As soon as you are happy with your layout, or if you managed to gather the previously missing material, you can just go ahead and start constructing. But you don’t have to click on each silhouette manually; the new upgrade tool comes in handy as it allows you to construct every single blueprint building with one click or even via drag and drop. Especially in the early game or in resource-constrained times, it can happen that you want to place a building but realize that you do not have the needed materials. In that case, the blueprint mode will automatically place a silhouette indicating that you are currently short on resources. Placing buildings in blueprint mode will not cost you any resources or money and they will not start operating before you complete their actual construction. The mind game when planning an efficient city layout is an integral element of the Anno experience, as construction space is as much of a resource as materials. Keep in mind that you will only be able to place buildings which have been unlocked by natural progression but that won’t prevent you from reworking your city later on of course. Of course, should you not be a fan of this feature, you will be able to disable it altogether. What do you think about the large-scale projects like the museum and the zoo as well as new city building tools such as the blueprint mode? Are you someone who can sink hundreds of hours to create the most stunning city or is efficiency key when establishing a real power economy?